I was a small part of a big court win for legal marketing today that I wanted to share. A Wisconsin lawsuit involving Google AdWords was filed a couple years ago that could have had a chilling effect upon the freedom of law firms to market online. I thought it was a must-win case for consumers. This case involves two prominent personal injury firms. 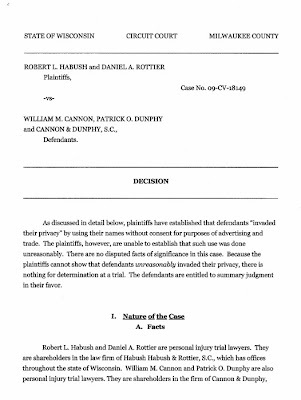 One of them, Cannon & Dunphy, used a PPC strategy to bid on the name of the state's largest PI firm, Habush Habush & Rottier. That is, when someone conducts a Google search containing e.g. the word "Habush," a Cannon & Dunphy link shows up in the shaded section as a Sponsored Link. It's like Avis or Priceline bidding on the search term "Hertz." It's standard practice in corporate America, but not as much with law firms. 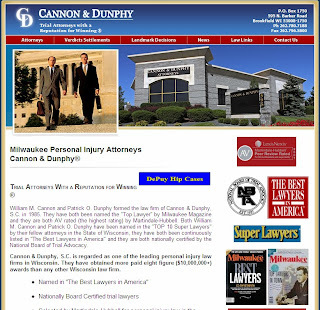 The Habush firm sued Cannon & Dunphy under a Wisconsin Invasion of Privacy law. One of the plaintiffs' experts, a law firm marketing consultant, argued that this was an unreasonable use, calling this "competitive keyword" practice "sleazy," and equating it with "lying, stealing, and misleading." 3. Is aggressive, but not unreasonably so. I think this is a big win for consumers looking for lawyers. Injured victims who conduct Google searches for the large or well-known law firms because they don’t know about any other lawyers, now can get valuable information about additional options and choices. 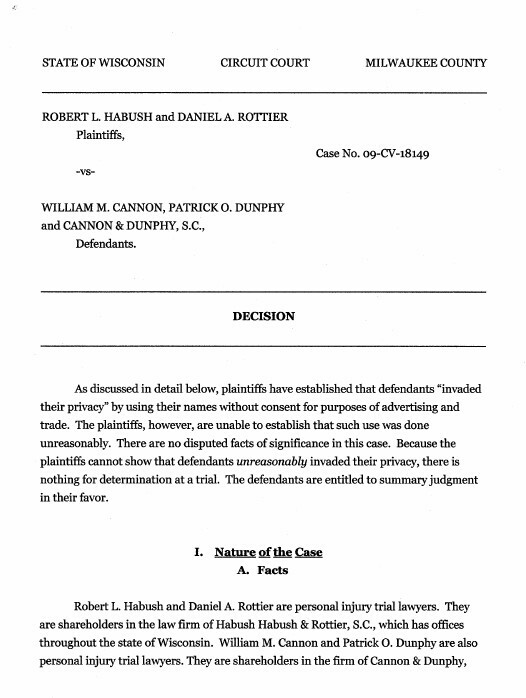 If the plaintiffs had won, it would have kept valuable information away from the most vulnerable clients and consumers of legal services. There were a variety of Free Speech and other arguments made but the court decided as a matter of Law that there was nothing "unreasonable" about this specific Sponsored Link conduct. I think this is also an important win for law firm marketing and freedom of firms to market aggressively on the internet. Any other decision could have had a chilling effect on creative and effective marketing. Ric Gass, the outstanding trial lawyer from Milwaukee's Gass Weber Mullins represented the defendants. 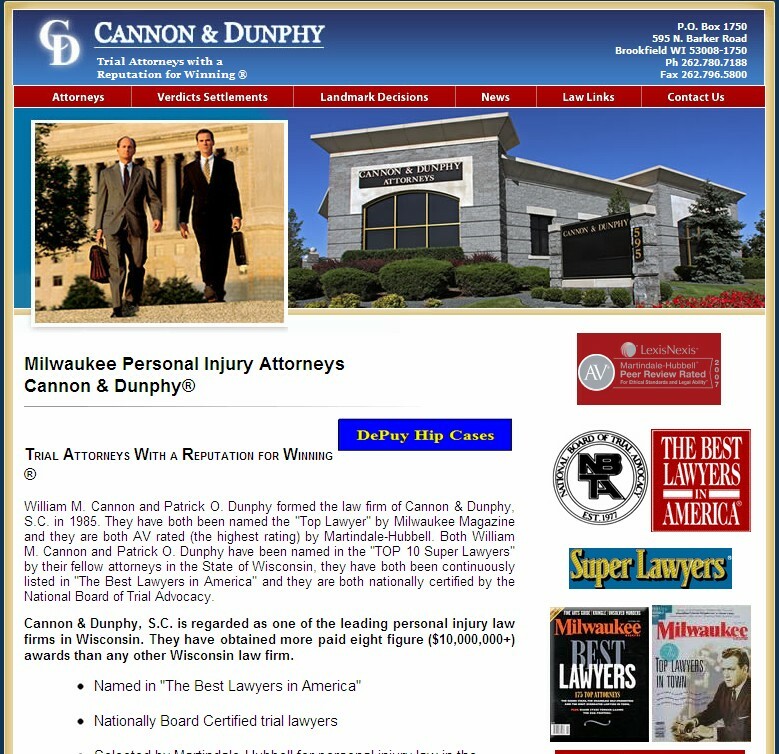 He phrased it this way to me a few minutes ago: "Bill Cannon and Pat Dunphy just won the right for other attorneys to use Sponsored Links to compete against them! And they don’t mind, they understand it's good for the consumers and for the legal profession, and are willing to have their credentials compared directly with other firms." 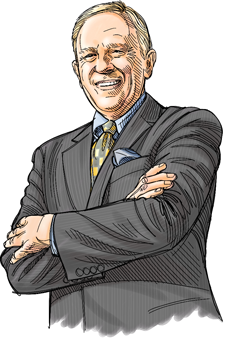 I've posted the entire 27-page opinion to the Resources section of our website, under "Featured Articles." I would recommend reading the court's analysis. Although I disagree with Judge Kahn's analysis in some areas, I think he absolutely came to the right conclusion. My lengthy court-filed Expert Report is also under "Resources" then "Web Sites and Internet." Thanks to Above the Law and "Valerie Katz" for the nice coverage. Small firms should follow her ATL posts - she always has good information. Images (c) 2011 Cannon & Dunphy and Gass Weber Mullins. Thanks for a great post that has some very important ramifications for attorneys who market themselves online. I've recommended that all attorneys who have a website and advertise online read this decision. Nice job. You gave great insights on marketing, thank you for sharing.